The film starts out as Scooby and the gang are knee deep in a scary mystery, when Batman saves the day. 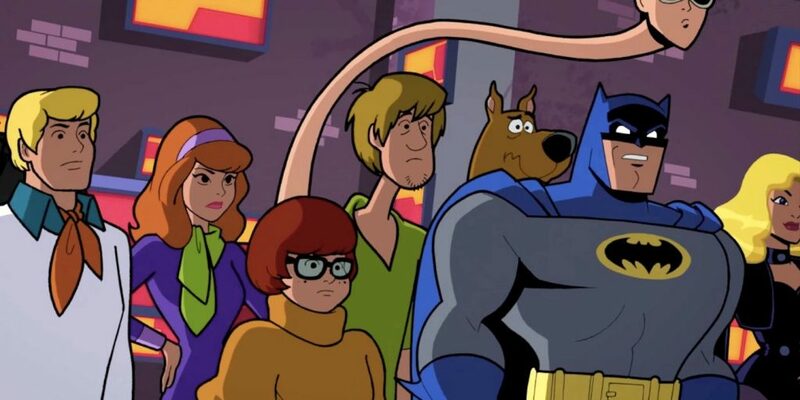 Turns out though, that Batman was testing Scooby and the gang to be part of his crime solving team or the Mystery Analysts of Gotham as he likes to call it. Martian Manhunter, Plastic Man, The Question, Black Canary, and Aquaman are all part of this Analyst team too. Oddly enough here, Aquaman is the comic relief and the biggest idiot of the group. He made me laugh every time he was on screen with his silly mannerisms and over-excited voice. Batman decides to let their new friends pick their next case, which is the only unsolved case that Batman has in his files. Batman is hesitant to agree to this, but eventually secrets are let out and we see a ton of the old school Batman villains show up, led by someone called the Crimson Cloak. From here, you have the DC superheroes trying to fight and solve the case, as Velma, Fred, and Daphne do the best they can to help. Meanwhile, Shaggy and Scooby are running from monsters and trying to eat everything in sight. There is a great battle in a cafeteria that turns into a food fight, which is presented in the most fun way as Scooby and Shaggy make their way out by eating everything, set to the old Pow!, Bang! Snikt! shots of the 1960’s Batman TV show. Those classic elements from both worlds are what make this new film so much to watch. The animation is decent enough and the voice acting is top notch as everyone turns in a dry wit and sarcastic tone for their characters, which works perfectly. Aquaman is perhaps the most entertaining character, because he is just so goofy, that you can’t help but laugh ever moment he is on screen. Plastic Man also brings laughs in a more adult way, which was great to see a mix of humor here. If this animated film doesn’t reboot ‘Batman: The Brave and the Bold‘ or spawn some sequels here, I’m not sure what will, because this it such a fun experience for all ages. This entry was posted on Friday, January 5th, 2018 at 3:23 pm	and is filed under Film, News. You can follow any responses to this entry through the RSS 2.0 feed. You can skip to the end and leave a response. Pinging is currently not allowed. « Dan Moran’s Top 12 Movies of 2017 Plus Extras!